(RNS) — There have been more positive encounters between Roman Catholics and the Jewish people since the conclusion of the Second Vatican Council in 1965 than there were in the first 2,000 years of the Christian church. But one major flashpoint has remained unresolved: the bitter controversy swirling around the role played by Eugenio Pacelli, whose 19-year pontificate as Pius XII began in 1939, in the wartime treatment of European Jews. Pius XII’s “silence” and inaction in the face of radical evil, it is charged, helped seal the fate of the Jews in Europe. 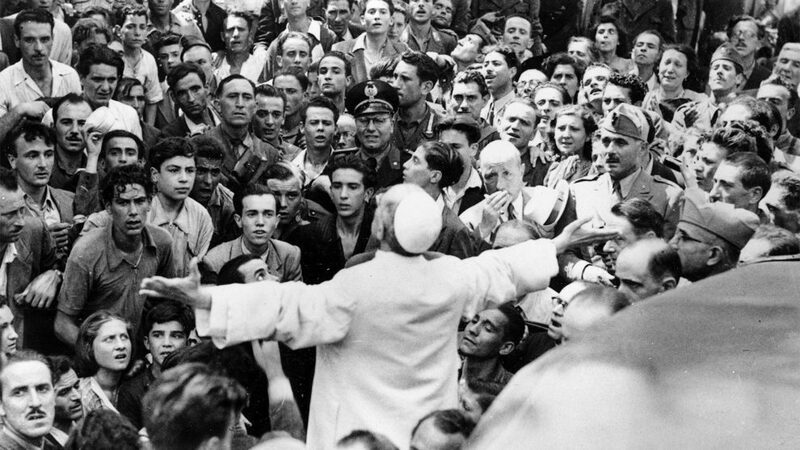 The criticism of Pius XII surfaced as early as the mid-1960s, after “The Deputy,” a play by the German Protestant playwright Rolf Hochhuth presented a thinly disguised account of the pope’s activities during the war. The play created such a public furor that Pope Paul VI ordered that more than 5,000 pages of official Vatican records from the wartime period be released to the public to counter Hochhuth’s claim that Pius XII failed to respond adequately to the Nazi regime’s genocidal policies. The release of those documents was concluded in 1981, but it did not silence Pacelli’s critics. In fact, it had the opposite effect. Because the 5,000 pages represented only a carefully selected partial record, demands intensified in the 1980s and 1990s that all pertinent Vatican records be made available to appropriate scholars, both Christians and Jews, for intensive study. Back then, I wrote that while the limited release of Vatican documents was necessary, it was not sufficient. The demands for full disclosure were consistently rejected, even when two prominent American Cardinals, Joseph Bernardin of Chicago in 1992 and John O’Connor of New York in 1996, joined in. In response, Vatican leaders have cited church policy that archival records cannot be released for 75 years — a justification that expires next year with the 75th anniversary of Nazi Germany’s defeat and the end of the Holocaust. Many countries have long since exposed their own actions during the war. Since the end of the Cold War, previously closed records from the former Soviet Union, East Germany and a host of other countries became available for inspection. A collective act called “Heshbon Ha-Nefesh” (Hebrew for “inventory of the soul”) has assembled a critical analysis of the roles played during the Holocaust by Switzerland, Sweden, Spain and Portugal as well as other neutral nations and the Allies. The potent issue of full disclosure and the so-called “silent” Pius XII has grown louder and stronger with each passing year. Few people are neutral about the Pope’s record and his response to contemporary attempts to save Jewish lives. Many Catholic leaders and some Jews have vigorously defended Pius XII. By citing the strategically chosen archival sources to bolster the Pope’s reputation, however, Pacelli’s defenders have, perhaps unwittingly, fomented more debate and increased public demand for a full reckoning. Just as the Vatican can muster its version of the “truth,” so do the critics of Pius XII. The spotlight of historical research and analysis must be focused on all parts of society — business, education, culture and religious bodies. No institution, least of all the global Roman Catholic Church, can be exempt from careful scrutiny. Hopefully, Pope Francis’ welcome action of transparency and the total release of primary source material will soon be available for teams of scholars to analyze. Such measures will help bring a sense of closure to the vexing question that has hampered, even poisoned, Catholic-Jewish relations: what were the wartime actions of Pius XII? Unless and until this happens, the issue of the Vatican’s role during World War II will continue to cause friction, anger and bitterness between Catholics and Jews. Indeed, the controversy over Vatican archives still has the power to undo many of the extraordinary positive gains that have been achieved since 1965. Pope Francis’ action is a welcome and constructive step. The time for obscuration, limited access and fierce public arguments driven not by scholarly findings but by defensive feelings and incomplete data and information has come to an end. Let the sunlight of openness flood the Vatican wartime archives. The entire world awaits. Read the book “The Silent Pope” (Pope Pius XII). Germany was 95% Catholic at the time when Hitler came into power (read the fact for yourself at the Auschwitz Concentration Camp). There is no way on earth that the Catholic Church did not know what was going on in Germany. In fact, many believe that the Catholic Church was responsible for Hitlers rise to power, evidenced by the fact ( which has been verified over and over again) that the Catholic Church facilitated the escape of the Nazi leaders to South America once their dastardly deeds had been done. The Catholic Church is no friend of the Jews or anyone else who chooses not to be Catholic. Pretty sure Germany was about 1/3 Catholic and 2/3 Protestant in the 1930’s. I’m no fan of Catholicism but if this is what you got from that book, you might want to do some follow-up, objective research to get a more accurate picture. The book “The Silent Pope” by dissident Dutch theologian Hans Jansen is not a historical reference work. It was closer to 50/50. Access to the actual files will dispel the false accusations. You’ll have to give me a reference. My initial one gives the numbers for 1933 I used above came from Wikipedia. I found a reference to a census in May 1939 Germany had it at 40% but that included Catholics in Austria and Sudetenland. In the beginning of the 1930s Germany was roughly 2/3 Protestant and 1/3 Catholic, the 2/3 in Prussia and the north and east, the 1/3 in Bavaria and parts adjacent. With the anschluss of Sudetenland and Austria immediately prior to WWII, that became more or less 55 to 45. Religious censuses during the war period and immediately thereafter appear to be MIA. The Protestants were split by the Nazi True Christian movement, but both sides were heavily persecuted. If this promise of transparency turns out to be like Francis’ promise of transparency with regard to the abuse cover-up, there will still be a lot of documents that will not see the light of day. Buy a ticket and head for Rome. It only took them 20 years after the Holocaust to disavow antisemitism. Things you probably won’t see an official rebuke of Cardinal Stepinac for his support of genocide n Croatia. It didn’t work. The Germans tried to “woo” Pius after they turned on the Russians. “Look! We are against Communists! The Pope didn’t buy it. You should not buy the false information about this Pope, now, either. Peace comes with knowledge. The Great Kibosh of All Religions is a great place to start and finish in thirty seconds. Priceless!! What information? All the information has yet to be released. This is nothing to disbelieve, yet. You have to wait until the documents are out there before you tell us what to believe, otherwise people might think you have prejudged the matter or ignored the evidence…. The 1939 census included new terroritories and showed 40% Catholic. Close enough. I knew the 95% figure was bogus and likely his ‘facts’ that follow. That is actually a fabrication, and I believe that is a fabrication has been pointed out to you a number of times before. He is citing the information already of record. I believe this also has been brought to your attention in the past. Worth reading is German writer Rolf Hochhuth’s play The Deputy. I am not sure how much credit or thanks should be given to Pope Francis on this matter as he is not doing anything but following already established policy. However, it does look as if he is acting so there won’t be any further delay. He could do that and has chosen not to. I have wondered if there wasn’t something in the secret files that would help us understand why Pius XII didn’t not react more forcefully in the face of the horrors committed by the Germans, and even by other groups who participated in pogroms, round-ups of Jews and other marginalized groups.. What was he afraid of? What balance was he trying to reach or maintain? But, I can look at it from the comfort of not having to fear anything, of not being responsible for something so massive as a nearly 2000 year old, world-wide institution that sought to teach the world the moral teachings of Jesus. Or putting several million Catholics in the gun sights of someone like Hitler. And, I am not Jewish. Is that it, the reason I can stand back a bit is because I am a part of the white, Christian, Western civilized, powerful culture? We need to know how to handle the same kind of thing because massive killings, genocide, religious killings are still going on around the world. Pray for the people of Yemen, for families fleeing gangs in El Salvador, for people starving and dying from lack of medical care in Venezuela, from … God grant us courage and wisdom and love of one another. You will note from the article that there was an original release, which critics did not consider sufficient. However, there are public records available from the same period, which are constantly IGNORED, which do not show the picture of Pius that some play depicts. Somebody, presents a play — The Deputy, I think it is called, and all other records go out the window! I wonder exactly what Pius was supposed to do, on his little piece of neutral territory? Full knowledge of the Holocaust did not come out until the Allies liberated the concentration camps. Time will tell. Truth will out. As I see it, the issue IS NOT whether the Church of Rome knew or did not know what was going on in Germany. It surely would have known. Rather, the issue is whether the Church was able to do more than it did before Germany was defeated. One can only hope the additional Vatican archival material will shed valuable light on this question. For now, I remain generally of the opinion that Pius XII did as much as he reasonably could without jeopardizing church help to the Jews. Time will tell. The Vatican already has a fascist government I bought and paid for in Spain. They stood idly by when Catholic appeals were used for recruiting Nazi collaborators in Belgium and Croatia. They did not rebuke Cardinal Stepinac as the Croatian Catholic Church performed forced conversions and supported genocide of Serbs and Jews. See Art’s reply to you. Art/Bob/Mark is blocked. I have no desire to speak with sock-puppets. You are mistaken, I think. If Art and Mark are one and the same they seem to be ambidextrous 🙂 If they were one and claimed to be the writer of John’s Gospel, and the Book of Revelation, you would deny it because their style is different. Only if you like fiction, in this case anti-Catholic fiction. Nope. Seen it before with him. He loves his sockpuppets. Odd comment coming from a sockpuppet, Vladonald. Be honest: your basic problem is with anyone equipped with facts. It is a play, based on fact. And the hero is a Jesuit priest. Read it for yourself, don’t let Mark/Bob lead you around. It is well-known to be a complete ahistorical piece of dreck. In 2007 a high ranking intelligence officer and defector from the Eastern Bloc, Ion Mihai Pacepa, stated that in February 1960, Nikita Khrushchev authorized a covert plan (known as Seat 12) to discredit the Vatican, with Pope Pius XII as the prime target. As part of that plan Pacepa alleged that General Ivan Agayants, chief of the KGB’s disinformation department, created the outline for what was to become the play. Mark/Bob appears to have simply picked up this info from the rather distorted item in Wikipedia. A better source of info on the play would be Eric Bentley’s book The Storm over The Deputy, which presents reviews of the play, forf and against, by a wide range of scalars. Mark/Bob will go to any length to defend the Vatican. Edd, you’re an over-the-top confirmed anti-Catholic. I could provide twenty references excoriating your suggested piece of anti-Catholic crapola, but what’s the point? The folks that would listen to you in the first place wouldn’t pay attention if Yahweh smacked them aside the head with a rolled up newspaper. The Bentley book is quite balanced pro and con on The Deputy. You call me anti-Catholic because you are honked that so many Catholics agree with me and not with you. I call you an anti-Catholic because it’s true, and you prove it by trying to palm off a piece of anti-Catholic propaganda as something else. There are massive amounts of records from Bad Arolsen to DC on Europe and world war 2. Why ask more? It makes no difference to the established narrative.